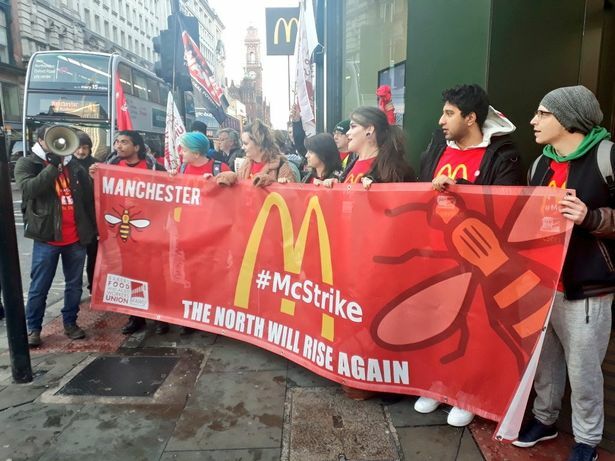 Recent notable developments have included the strikes that took place at five McDonald’s stores on May Day, the indefinite strike in Bromley libraries ending with workers winning a pay increase and other concessions, cleaners at Kuwait Investment Offices winning the London living wage after a six-month campaign, and a threatened strike by cleaners at Ernst & Young being called off after the employers confirmed that there would be no compulsory redundancies or cuts to hours. Meanwhile, the cleaners at Kensington & Chelsea town halls, who’ve organised through the grassroots union UVW, are also set to strike for the London Living Wage. 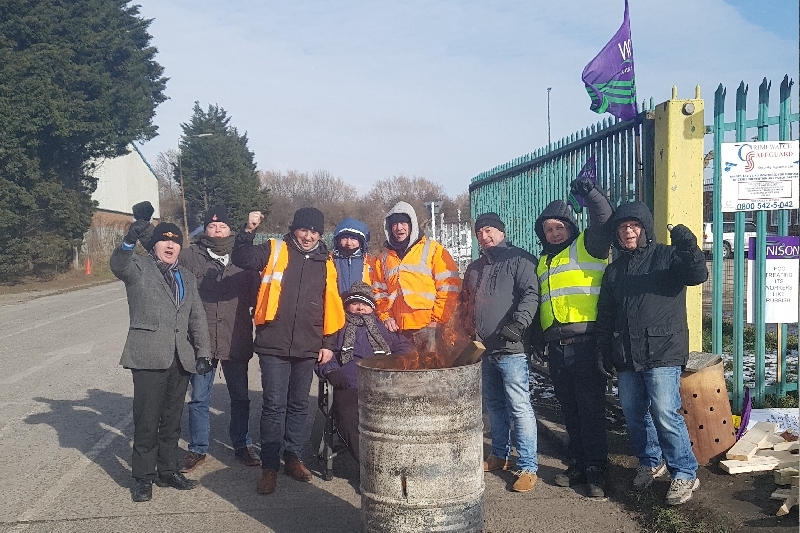 At FCC Environment in Hull, recycling workers have been fighting for decent pay and conditions, including the right to sick pay, and have been out on strike since the start of the month. If you’re in the area, they’ll be picketing every day until the 14th and would welcome your solidarity, and people anywhere can donate to their strike fund. May Day in Hull also saw a spontaneous wildcat strike by construction workers after fifteen people were sacked for raising safety concerns. Also in Hull, staff at three sites across the Hull College Group will be walking out on May 9th against threats to cut 231 jobs. The 9th is set to be a fairly eventful day, as RMT members on Northern Rail and Greater Anglia (but not South Western Rail, that’s now been suspended) will also be striking in the latest installment of the long-running driver-only operation/Keep the Guard on the Train dispute, and Al Jazeera staff will also be striking that day as they’ve not had a pay rise for four years. On Thursday 10th, Fujitsu workers and their supporters will be protesting at a HR Directors’ Dinner hosted by “Business in the Community” (BITC) – the idea of a big get-together of HR directors is nauseating anyway, but they’ll be particularly drawing attention to the fact that BITC’s board of directors includes the regional head of Fujitsu, a company which has sacked several workers for whistleblowing and union activity. Donations and messages of support to support@ourunion.org.uk are always welcomed by the Fujitsu workers, as are messages of protest to the Fujitsu boss at Duncan.Tait@uk.fujitsu.com (cc in support@ourunion.org.uk so they can see it). 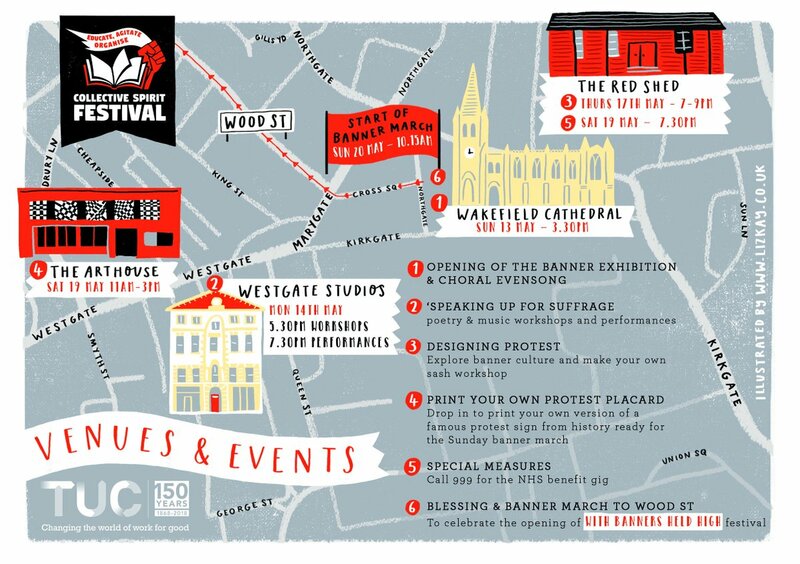 Wakefield’s annual trade union festival, With Banners Held High, will now be part of a week-long “Collective Spirit” event, starting on Sunday May 13th, although the main event will be on Sunday 20th. Workers in a Tesco distribution centre in Dagenham will be taking strike action over pay on Thursday 17th-Friday 18th May, an interesting development due to the importance of distribution warehouses in today’s economy. On Friday 18th, staff at TGI Friday’s in Milton Keynes and Covent Garden will be striking over tips and pay, while other workers at stores in London, Manchester, Newcastle and Gateshead are currently balloting over whether to join in. Coming hot on the heels of the high-profile McStrike, this dispute is already attracting some media interest. 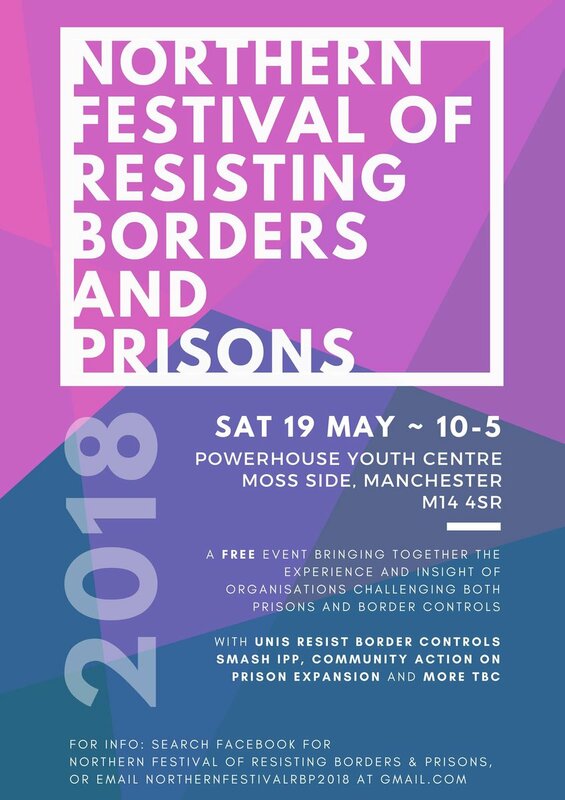 The weekend of May 19th will be a busy one in Manchester, as it’ll see an anti-racist community football tournament, Our City United, as well as the Northern Festival of Resisting Borders & Prisons. The following week will see Leeds Anti-Fascist Network host an open meeting for people interested in getting involved in anti-fascism in Leeds on Tuesday 22nd, while one of the sacked Picturehouse workers will be giving a talk in York on that dispute on Thursday 24th. The Picturehouse strikers will also be organising a big evening of discussion in the capital on Monday 28th. 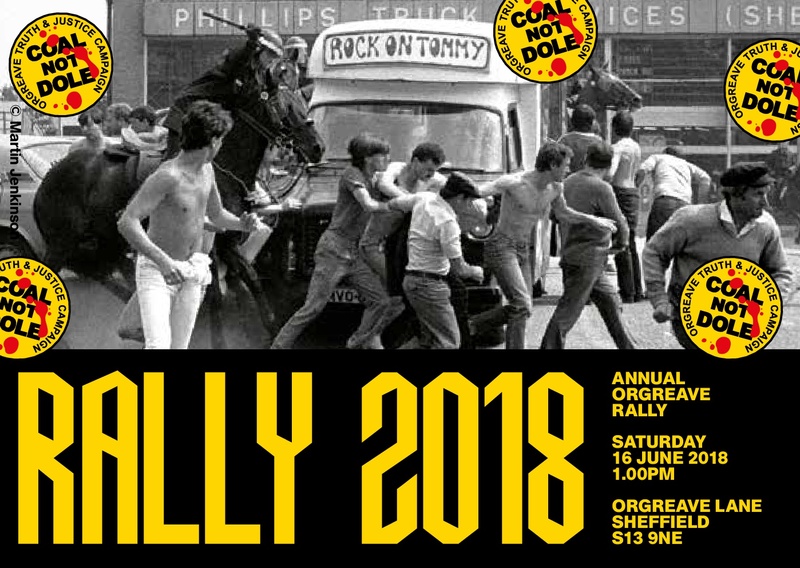 Looking ahead into June, a few dates of interest include the Antiuniversity, running in London from the 9th-15th, June 11th, the international day of solidarity with long-term anarchist prisoners, Manchester’s annual anti-fascist 0161 festival, which will run from the 14th-17th, and the annual Orgreave commemoration rally on Saturday 16th. In UK legal/repression news, a request has gone out to support Kevan Thackrar, a prisoner who’s been held in solitary confinement for over 8 years, and the undercover police inquiry continues to drag on, with recent developments including spycop-turned-whistleblower Peter Francis giving up on the whole process as a farce, Reclaim the Streets infiltrator Jim Boyling/Sutton being officially sacked for deceiving activists into relationships without getting all his paperwork in order, and the naming of several more spycops, including Dave Hagan, the man tasked with spying on the Lawrence family. On a more general note, the South Essex Stirrer have some interesting thoughts on what might be possible during Trump’s upcoming visit if we refuse the temptation to just go for a kneejerk big event in central London. Finally, a few international notes – the Russian anarchists and anti-fascists appealing for solidarity against state repression have a new site up at Rupression, tenants in East Hamilton, Canada, launched a rent strike on May 1st and welcome donations to their strike/hardship fund, and the Dialectical Delinquents site continues to be a valuable resource for keeping up with events worldwide, but particularly in France. They’ve recently added an English translation of “another boring leaflet” dealing with some of the limitations and contradictions of the current movement. CrimethInc also have a fair bit of content about France, especially dealing with the ZAD – “One But Many Movements” is particularly recommended as some of the most indepth English-language coverage available for those wanting to understand the internal divisions within the movement. And a quick North American repression and prison news round-up: revolutionary prisoner Xinachtli/Alvaro Luna Hernandez has an upcoming birthday on May 12th, long-term black liberation/former Black Panther prisoner Herman Bell has finally been released in the face of stiff opposition from the NYPD and their supporters, and Hamilton anarchist Cedar is currently in jail awaiting trial on conspiracy charges connected to a small riot against gentrification, and could use letters of support. The Defend J20 Resistance campaign are asking for a call-in to pressure the US attorney’s office to drop the charges against the remaining people facing charges from Trump’s inauguration on May 10th-11th, as the next round of trials is set to start on May 14th. Meanwhile, Corey Long is still facing charges for his alleged role in defending Charlottesville from the nazi march last summer, with his trial date set for June 8th. 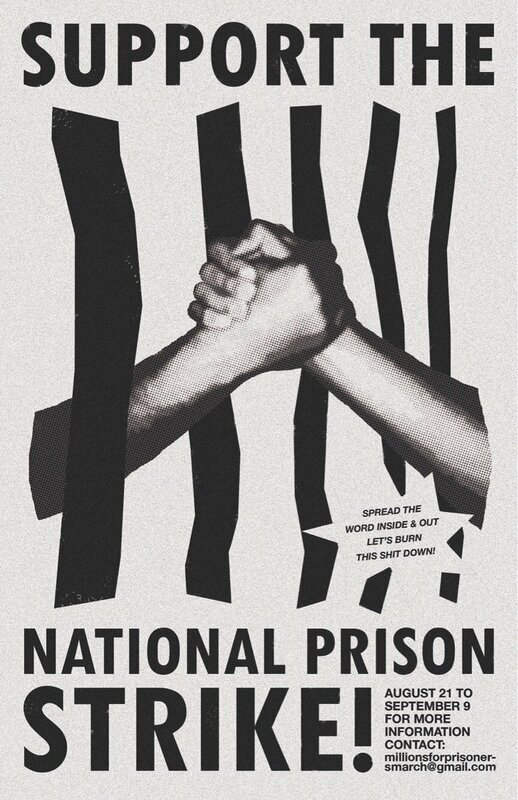 Further ahead, prison organisers are calling for a big mobilisation on “Juneteenth” (June 19th), and plans are circulating for a national strike starting on August 21st. This entry was posted in Anarchists, Housing, Repression, Strikes, Unions, Work and tagged BFAWU, Crimethinc, Fujitsu, Herman Bell, IWGB, J20, Kevan Thackrar, McDonald's, Orgreave Truth & Justice Campaign, Picturehouse Living Wage, prisoner solidarity, rent strike, rmt, spycops, tesco, TGI Friday's, Undercover Research Group, United Voices of the World, Xinachtli. Bookmark the permalink. ‘TGI Strikedays: class struggle and events round-up for early May’ Latest update on the ‘Cautiously Pessimistic’ blog.